The bus dropped me off in the middle of the road at close to 6 am in the morning. I was cold, tired and feeling lost. The roads and streets didn't look like what I would see in a supposed tourist town. I approached this local and kept repeating my destination to him. Throughout the bus journey, I constantly checked back with the bus attendant to make sure that she would not forget my destination. Thinking back, I think I must have seemed like an insecure nutcase to all these people. A truck came and said 8000 kyats to Nyaung Shwe town. I was too tired to bargain and so I said 6000 kyats and he agreed to my price. I hopped on to the truck and on the way to my guesthouse, I got to catch the moment before sunrise. I was dropped off at May Guesthouse. If you are looking for a comfortable and cosy place to stay, May Guesthouse is a good choice. I paid USD$20 for a night but I got a whole room to myself and breakfast was included as well. I washed up, left my belongings at the reception and headed out. I had planned to do the one day Inle Lake tour which should start by 730 am. It was USD$18 for a boat and you can have a maximum of 5 people on the boat. So, it makes sense to do the boat tour with more people but I was alone so I decided to head out myself! After the long bus ride, I decided to treat myself to some fried dough. Bought the plain one and the one with bean paste inside. It was oily but yummy! I felt that the fried dough in Myanmar is a bit more sweet than those we have in Singapore. I walked to the jetty and a guy came up to me and asked if I wanted to take the boat tour. I said yes and so off I go! There's a pretty standard itinerary which includes stops to see the famous leg rowers, a weaving factory, cigar-makers, boat builders, local blacksmith among a few others. The boat tour was an interesting experience but I was a little bit disappointed with how the tour seemed to be specially made for tourists. They bring you to houses along the lake where they try to sell you their 'local' products and stop at places where people pose for photos for tourists to take. Nonetheless, I enjoyed the magnificent scenery a lot, which made the whole boat ride a great experience on a whole. Some of the famous leg rowers are hired to pose for tourists like me. After striking a pose, they will actually wait for you to tip them. I ended my boat tour really early, at around 2 plus. The boat tour was supposed to end around 5 pm normally but I guess I move quite fast, especially at places where I was not so interested in. I headed back to the guesthouse and took a 30 minute break before heading out on a bicycle. Bike rentals are so cheap in Myanmar! I got my bicycle for 1500 kyats for the entire day. The sun was a killer but luckily, the weather was not humid. I cycled around the town and bought some postcards. If you head to Myanmar, you will realise that the locals like to go to teahouses. The traditional Myanmar teahouse is basically a place for tea, snacks, breakfast, noodles; a place for people to catch up or for a simple meal. If you have a chance to, you should definitely experience their local lifestyle at a teahouse. I had the Shan Noodles with chicken. Okay, Shan Noodles are really yummy and it is a must eat if you visit the Shan state! Nyaung Shwe town is in the Shan state, so Shan Noodles are available everywhere. I ordered a cup of milk tea (I didn't know that they have different kind of teas until I met this other group of backpackers who shared with me their tea knowledge.) as well. After my tea break, it was time to head to the winery. I had a hand drawn map from the guest house but I guess it wasn't really drawn to scale, so I felt lost after a while. Luckily for me, I saw this guy who was cycling in the opposite direction. I called out to him and he was nice enough to stop his bike for me. It was such a coincidence because he was actually out looking for the winery as well but was heading back as he could not find it. I was pretty bent on finding it, so he decided to join me! I think we took around 45 minutes to cycle to the winery from the town. When we reached the winery, it was bustling with people (mainly foreigners). The winery has a nice outdoor area, overlooking the town; a perfect spot to catch the sunset. I am not a wine expert but my new friend, D, is a wine connoisseur and works in a winery/vineyard in Australia and he said that the wine was pretty good! We left after the sun was almost fully down. It was quite exciting cycling out in the dark and we had no headlights with us. We ended the day with dinner and some Myanmar beer. Good day! Before I reached Inle Lake, I had read other travel blogs that mentioned about a day trek in Nyaung Shwe. I really wanted a break from all the city life I have been leading and so I decided to sign myself up for the trek. I thought that it would be really expensive as I was by myself but it turned out okay! I had breakfast at the guesthouse and headed out with my guide, Aung, at around 830am. I was surprised to see such a young guide actually. We trekked past schools, temples and villages throughout the day. Our first stop was at a school. I was actually quite surprised to find a school in the middle of all those mountains. The children started crowding around us and Aung took out his packet of sweets and started asking me to distribute to the kids. I felt so bad that I didn't prepare my own packet of sweets. Lunch was at a house in the village. 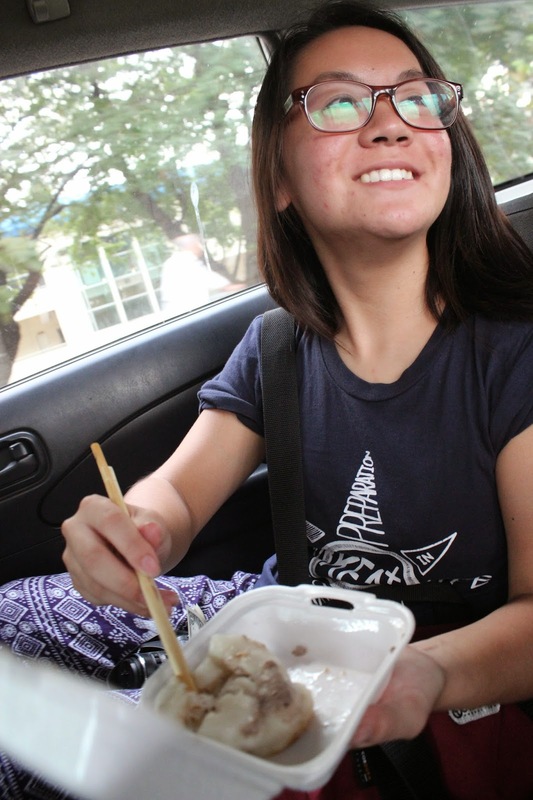 I was really hungry by then and I was so happy when Aung turned to me and said that it was lunch time. The food was simple but it was enough to lift my mood up. I didn't have to pay for lunch but I decided to drop a tip for the host family who was nice enough to make space and food for me. The trek ended at around 3 pm in the afternoon. I was feeling burnt and tired at the end of the work. The last stop of the trek was back at the winery! I had another round of wine, this time on my own. Then Aung sent me back to my guesthouse. It was time for me to pack up and wash up for my night bus at night! Headed to this famous Italian restaurant Golden Kite just 5 minutes away from my guesthouse. I would definitely recommend this restaurant! I had Gnocchi with eggplant in tomato sauce. The homemade gnocchi was yummy and the eggplant tasted really sweet. 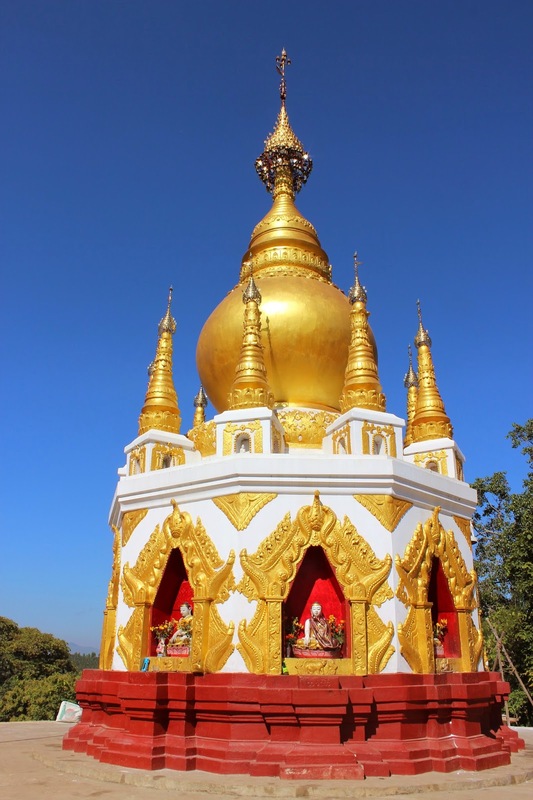 Lin Htett is located along the main street of Nyaung Shwe. I paid around USD$3 for a set of curry. This was probably the best Myanmese Curry I had in my whole trip. There were plenty of beef and the sides were really yummy as well. If you make a trip to Myanmar, you should definitely try their local curry. The usual choices would be chicken, pork, beef or fish curry. The sides and the curries are on the salty side so please have it with rice! After dinner, I headed back to my guesthouse and waited for my pickup truck to come. Time to head to Bagan! Stay tune to Day 4/5/6 in Myanmar. Read more about my first solo travel experience in Myanmar here! When I boarded the plane, I was feeling scared, yet excited for the trip that was finally here. I met a fellow solo backpacker, Yury, on the plane and I am so thankful to have met a like-minded soul who was on her first solo travel as well. She had some plans on hand and so I asked if I could join her for the day. I got Ooredoo because it was the cheaper option and also because I thought that I could probably survive without the phone in Myanmar. The reason for the price difference is that Ooredoo only has network in the big cities i.e Yangon, Mandalay whereas the other Telco has network in all the places. I used the card for 2 full days and I switched on my 3G network most of the time. I still have leftover credit in my card when I left so I guess 3G is not really expensive in Myanmar. We hired a taxi for USD $50 for the whole day. We figured that it would make more sense as we had our backpacks with us and no where to keep our bags. 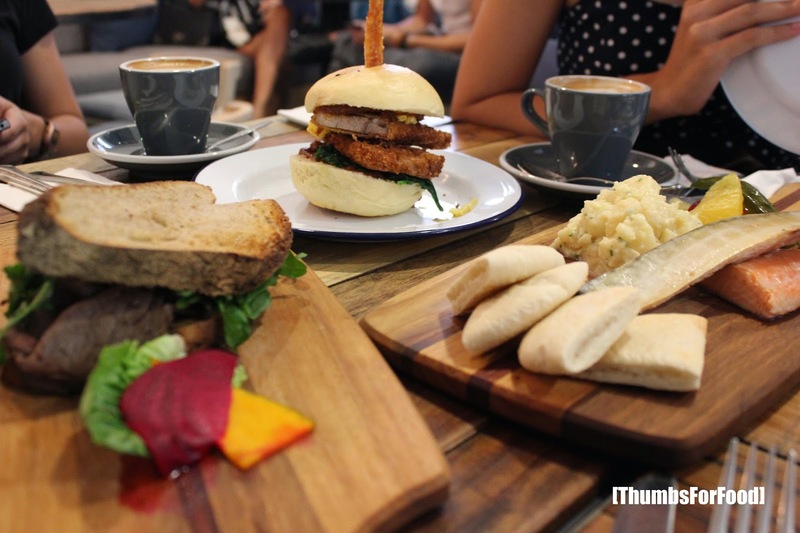 Our first stop was to a social enterprise cafe "Yangon Bakehouse". Yangon Bakehouse operates as a social enterprise that provides employment and training opportunities to disadvantage Burmese women. We were there during the lunch hour, which explains the crowd. Yury had the pumpkin pie which was really delicious while I tried the green curry chicken pie. I enjoyed the pastries there and would definitely recommend this little café to fellow travelers! After lunch, we headed to many different temples and pagodas. Honestly, I am not familiar with the history and traditions of Myanmar so I will let the pictures do the talking. We also went to the National Museum (Yangon). The museum is huge! There are a total of 5 levels and for those who are interested in the history and culture of Myanmar, it will be a good place to spend your afternoon. Throughout the day, I was still undecided on my plans for the night and the day after. Yury was going to leave for Mandalay on the 9pm bus and I was still stuck between staying in Yangon for a night or to leave for Inle Lake/Bagan. At least I knew that I definitely wanted to visit Inle Lake and Bagan. My taxi driver, Tun Tun, was very helpful and helped me to make some calls to check if there were still bus tickets to Inle Lake. I wanted to buy tickets from JJ Express as that seemed to be the safest (most comfortable) option. But the tickets were sold out for both journeys to Inle and to Bagan. Tun Tun suggested another bus company which till now, I don't even know the name of the bus company. After the ticket was bought, I felt more settled. Called and booked for accommodation at Inle Lake and I was lucky to get a room for myself at May Guesthouse. So, I would definitely recommend you to book your bus tickets in advance if you want a more comfortable bus ride! Our last stop of the day was to the Bogyoke Market. The plans changed as I had to reach the Aung Mingalar Bus Terminal at 6pm for my bus. The traffic in Myanmar can be quite bad, especially during peak hours. We left the market at around 445pm and reached there at 6pm. The market was packed with tourists, all looking for bargains and souvenirs to bring back home. The things they sell in the stalls are pretty repetitive and if you are heading out of Yangon, you should probably get your souvenirs there. The prices outside the capital city are more competitive! While walking around, I got real distracted by the street food. When I shared that I was heading to Myanmar, my friends warned me to be careful of the street food as they had incidents where they ate the food and fell ill. But the food was calling out to me as I walked past the vendors, so I just had to buy. This is my favourite of all street food in Myanmar! The deep fried stuffed tofu was really finger licking good. The combination of the cabbage, tofu, crunchy nuts, and the special sauce is just heavenly! There were also many dessert stalls and we decided to buy coconut rice dessert which was not to my liking. So after a day of exploring, it was time to say goodbye to my travel buddy for the day. I think it is amazing how it felt so comfortable hanging out with her even though we just met on the plane. Safe journey, wherever you may be now! I was dropped off at the bus station. When I boarded the bus, I was surprised to find that the bus was packed with locals. Then I realized I couldn't communicate with the driver nor the attendant on the bus. I got worried about whether I would be able to reach my destination safely. The bus ride was not very comfortable as the seat space was a bit tight. Halfway through the bus ride, I realized that the guy seated beside me was actually a Chinese! I felt so happy to find out that there was someone who could speak the language I speak. He said that it was his first time in Myanmar as well, and he was here to work. We didn't talk much as his accent was quite hard to understand. At around 4 am in the morning, we had a stopover. At the point when I was feeling so cold (really cold in the mountainous area) and tired, the Chinese man approached me and gave me a can of redbull. I was so touched by his kind act. Well, so I bought him a hot bun in exchange too! This simple act of kindness brought me so much warmth and I am so thankful to be meeting all these kind souls out there in the world. I will remember to pass this kindness on to other people! 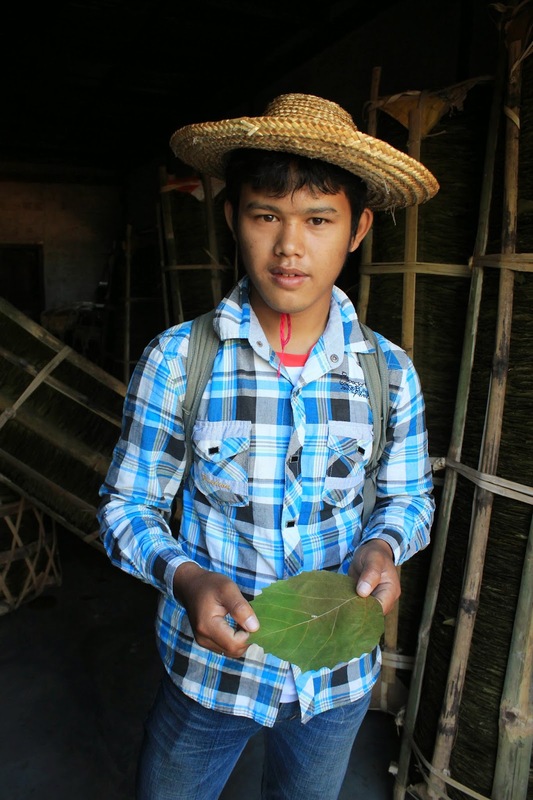 The next post will be on Day 2 and Day 3 at Inle Lake! Hello everyone! 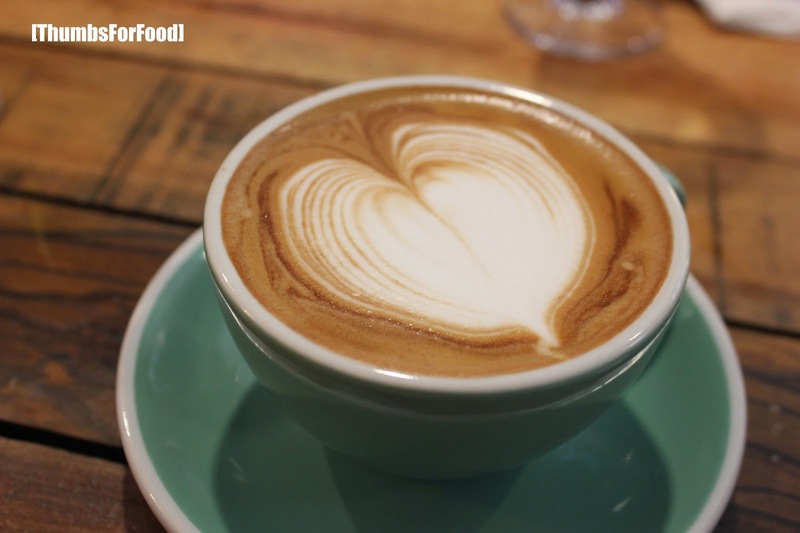 We wrote a brief post on The Lokal previously. We did not have the chance to try out the brunch items, so we just had to head back again to have brunch. We headed there on a Saturday afternoon and we had to wait a while for a table for 6. The place was, as usual, bustling with the strong aroma of coffee in the background. 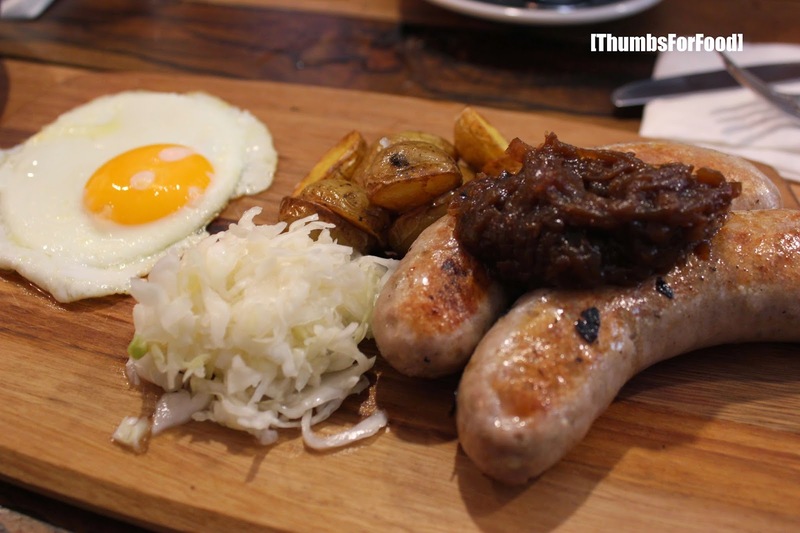 Grilled Sausages with homemade sauerkraut, sautéed potatos, fried egg and onion jam $23. I love the onion jam as it goes well with the savoury sausages. This is definitely a dish to order if you love good sausages. What makes the dish stand out is the wonderful sides that compliments the main character. 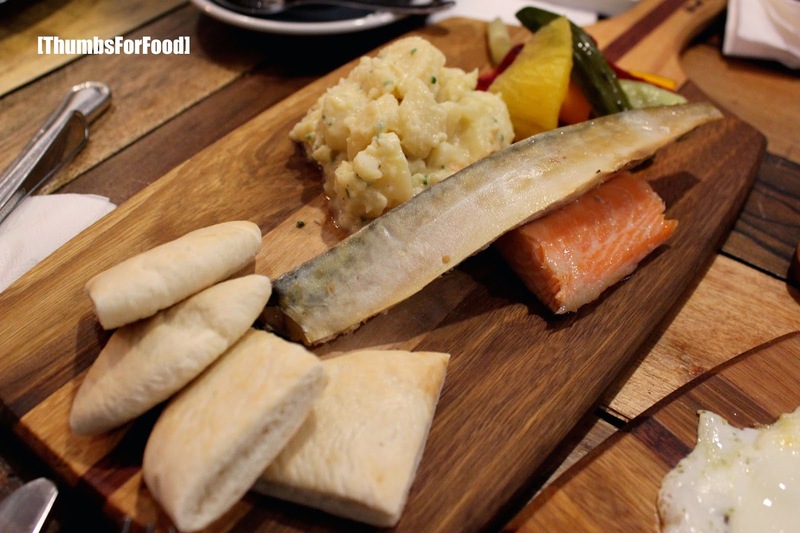 Plate of smoked mackerel & salmon, pickles and pita bread $22. If you are looking for something unique, this is the dish for you. I have never had smoked mackerel before and even the smoked salmon tasted different because they actually smoke it (Is that the right term?) themselves. I like it that both the mackerel and salmon are not too salty as well! 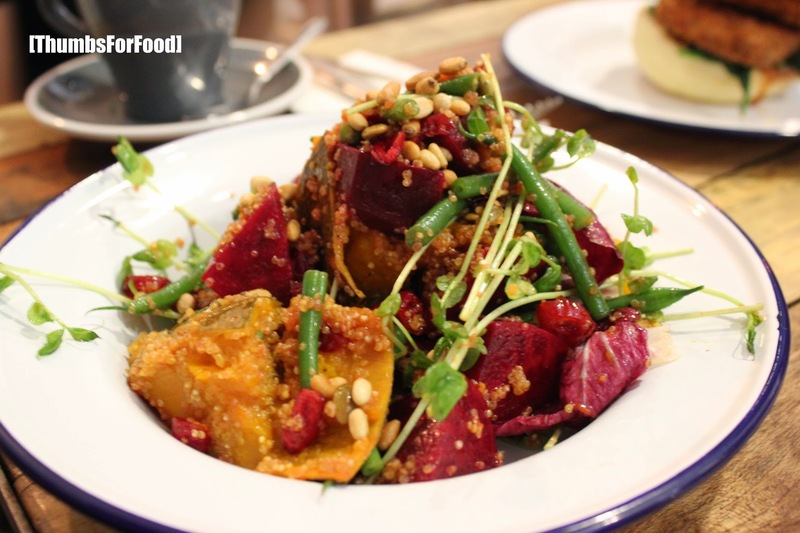 Salad of roasted pumpkin, French beans, quinoa, cranberries, pumpkin seeds, beetroot, house vinagarette $16. This has got to be my favourite dish at The Lokal. To be honest, I am not a salad fan but I love pumpkins and anything related to pumpkins. There are so many ingredients in the salad that every mouth was full of surprise. A dish for the health-conscious! 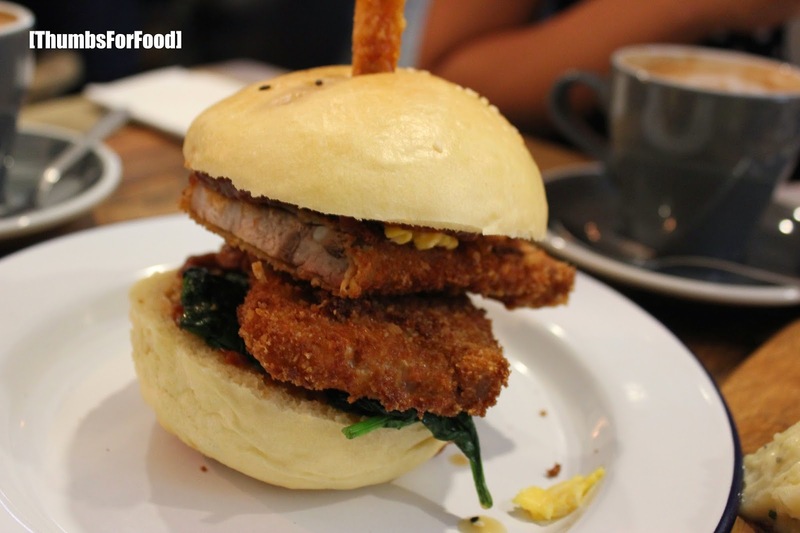 Breakfast burger with pork belly, broken omelette, spinach and chilli jam $23. I was quite disappointed when the pork belly came in a fried form. I find this dish pretty ordinary and probably wouldn't order this dish on my next visit. 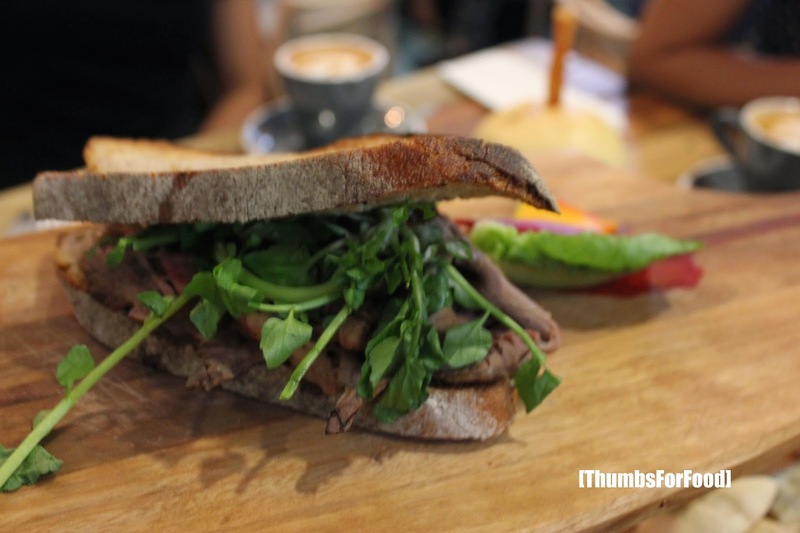 Roast beef on rye, caramelised onions, watercress and grain mustard crème fraiche $19. The beef was soft but I do not like rye bread in general, so this is definitely not my top choice! 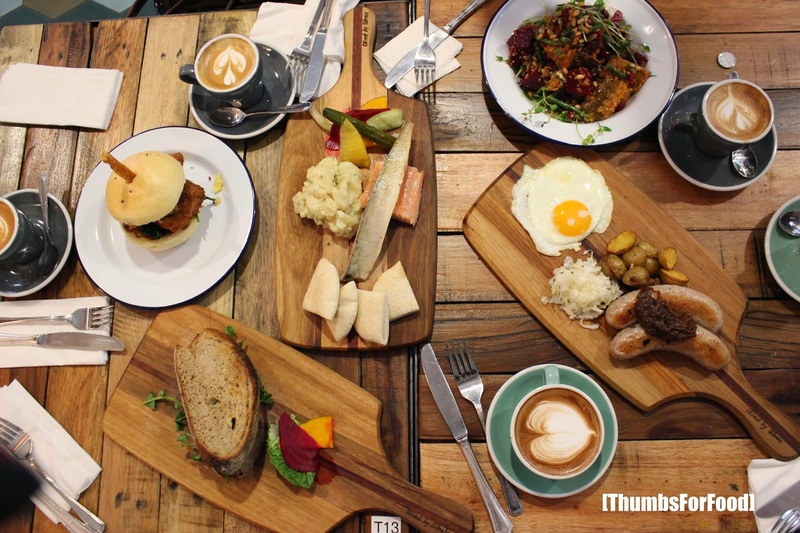 Overall, I had a pleasant experience at The Lokal. I really like the décor and ambience of the café; reminded me of my Melbourne days! The prices are on the steep side though but I would definitely revisit if there's no queue!